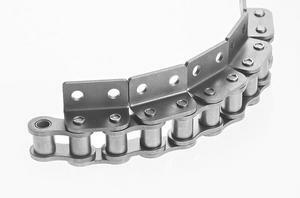 RS attachment chains consist of standard RS roller chains with added attachments. The smaller pitch allows it to transport small objects at high speed where conveying distances are short. Below diagrams show some of the common attachments used for general purposes. Tsubaki also produces a wide range of attachments to suit almost all applications. They are available in most ANSI and BS standard sizes.